*This post for shrimp caesar salad stuffed sweet potatoes is sponsored by Dole Fresh Vegetables. I was compensated for my honest opinion and recipe development. 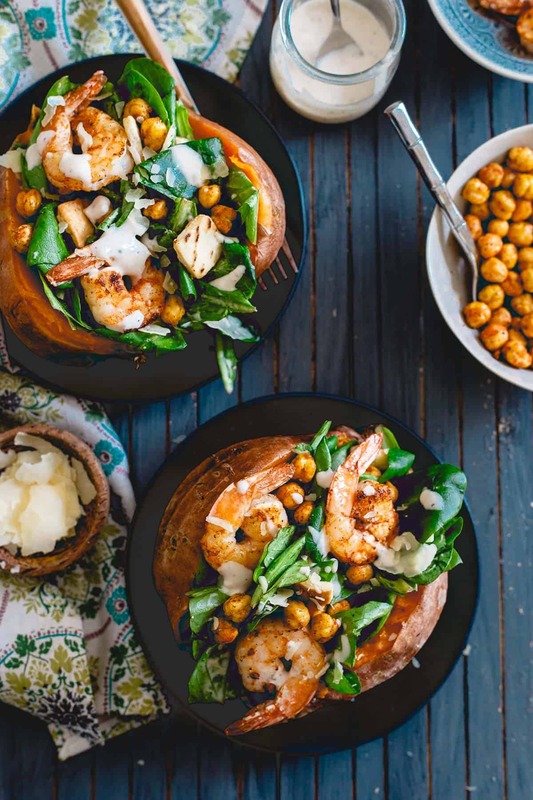 Topped with spicy cooked shrimp and roasted chickpeas, these caesar salad stuffed sweet potatoes are a healthy, complete meal! I live with a caesar salad fiend. Seriously, there was a point in life where anytime and I truly mean any-damn-time, we’d go out to eat, Ulysses would order a caesar salad. Usually with chicken, sometimes with shrimp and other times just as a starter but always.the.same.salad. Don’t get me wrong, I love a good caesar salad (although, partial to the kale version like this sriracha kale caesar salad), preferably light on the dressing but always with a respectable amount of parmesan. But, when you’re at some fancy farm to table place with ten million better things on the menu and your significant other wants to order a caesar salad for the 100th time instead of something unusual/unique that you want to try, I think you’d get a bit ragey as well. At home, it’s a different story. He can eat all the caesar salad he wants. Plain in a bowl? Sure dude, go for it. 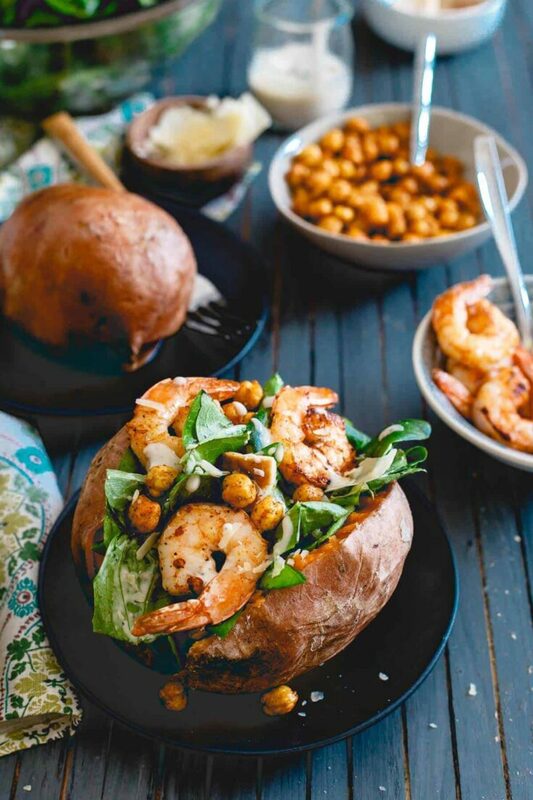 Stuffed in a sweet potato with some shrimp and roasted chickpeas? Now we’re talking. The new DOLE® Organic Salad Kits make both those options super easy. 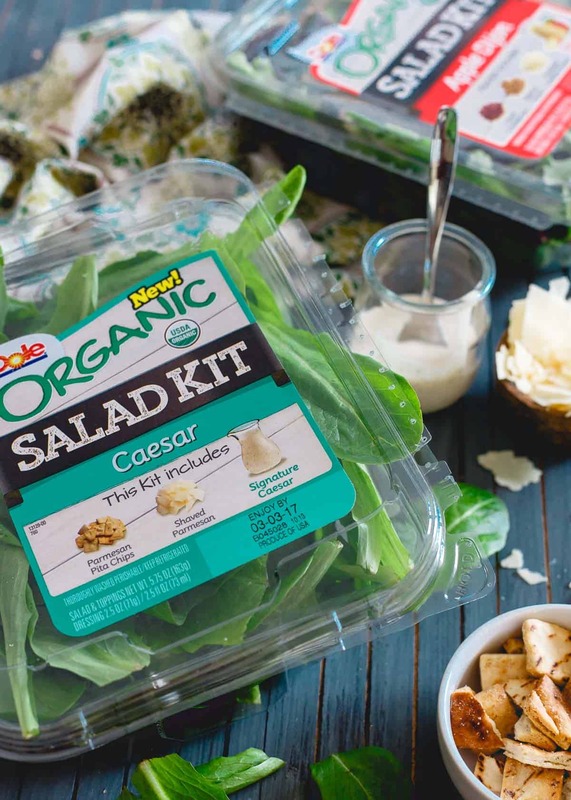 Their caesar salad kit comes with everything you need to make the perfect caesar inspired meal: parmesan pita chips, shaved parmesan, a creamy caesar dressing and baby romaine (<– which I love in place of the cut romaine lettuce normally in caesar salads) all in one convenient and affordable package. The kits also come in an apple dijon variety complete with spring mix, dried cranberries, walnut pieces, shredded cheddar and a signature apple dijon vinaigrette which is equally delicious! The caesar kit, however, was perfect for stuffing in these roasted sweet potatoes with spicy cajun shrimp and roasted chickpeas. Spice and caesar go really well together (like in this mason jar sriracha shrimp caesar salad). The creamy caesar dressing and the kick of heat are one of my favorite combos. I also love stuffed foods. From stuffed zucchini to steak stuffed grilled avocados and every stuffed possibility in between, it’s the perfect way to eat a complete meal in a tidy little package and the type A in me digs that. 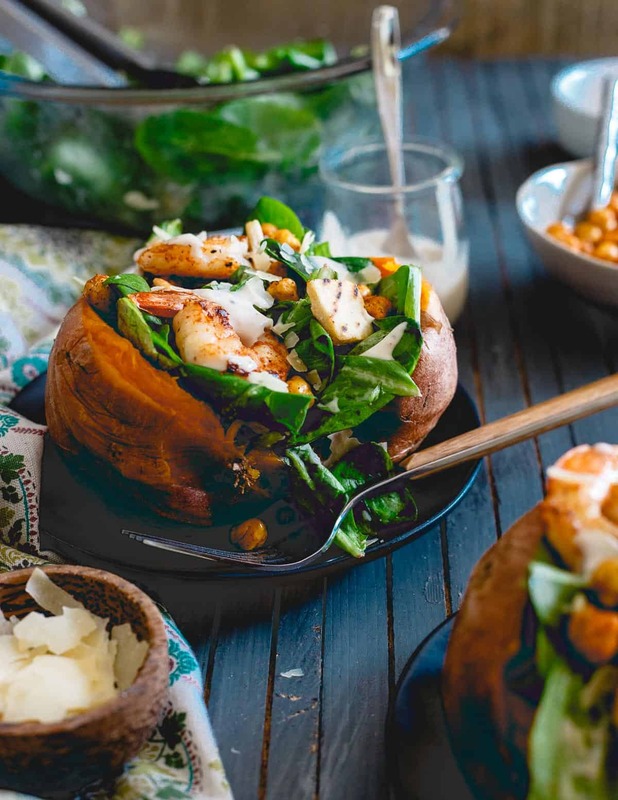 So basically, these shrimp caesar salad stuffed sweet potatoes are a winner all around and one of the few times I’ll allow a certain someone to have his caesar salad without an accompanying eye roll from across the table. Add the chickpeas, 1/2 tablespoon olive oil, salt, pepper and 1 tablespoon of the cajun seasoning to a small bowl. Toss to combine then spread out on a parchment lined baking sheet. Place in the oven towards the end of the cooking time for the potatoes and roast for 10-12 minutes, until golden brown and crispy. Add the remaining 1 tablespoon of olive oil to a skillet over medium-high heat. Toss the shrimp with the remainder of the cajun seasoning, salt and pepper to taste. Once hot, add to the skillet and cook until pink on both sides, about 5 minutes total. 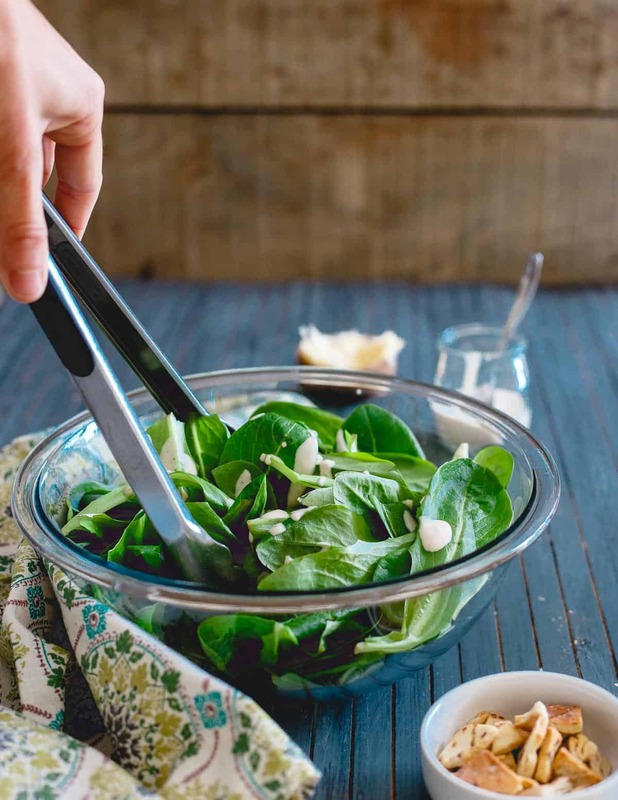 Prepare the caesar salad by placing the greens, pita chips, parmesan and dressing in a large bowl and tossing until well combined. 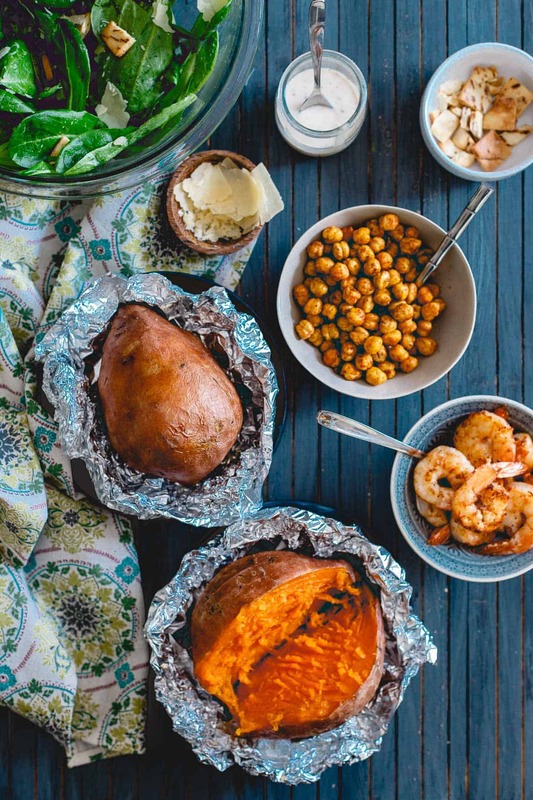 Assemble the sweet potatoes by slicing down the middle of the cooked potato and stuffing with the caesar salad then topping with the cooked shrimp and chickpeas. Love everything about these stuffed sweet potatoes! Those salad kits are so convenient! This looks like a delicious dinner! I like that the salad kit isn’t in a plastic bag! I like those containers better! and dude, what a fabulous idea, LOVE! Such a creative recipe Gina! I love all the ingredients. I’ll have to look for those salad kits the next time I’m at the market. Thanks for sharing! This is such a fun idea! Love the sweet potato salad combo!! Incredible! Oh my goodness, this is brilliant! 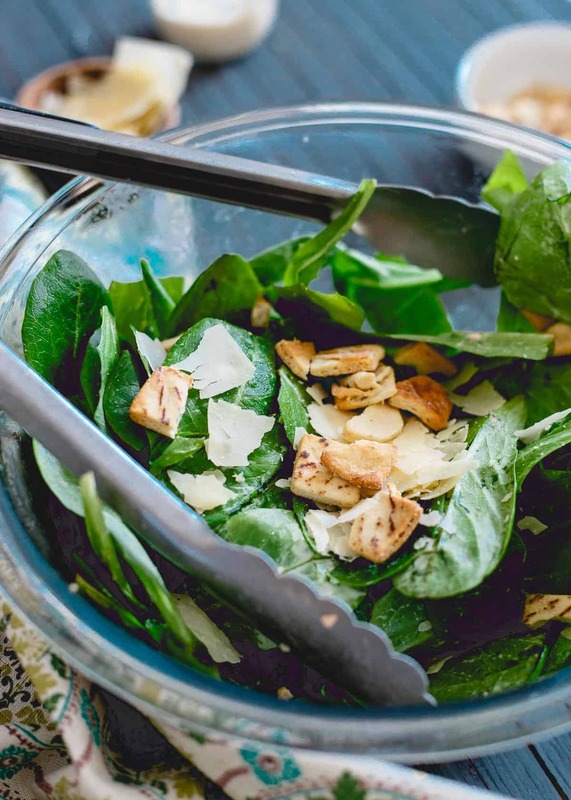 Loooove ceasar salad, and love how you jazzed it up! Such a good idea to put it in a sweet potato! And matt and I do the same thing – we go through these runs of things until we completely burn out on them. So I’m liking your idea of giving it a makeover like you did here. So healthy and packed with flavor, this looks so good! I am absolutely in love with this combo. I do love Caesar salad, but in a sweet potato? That’s just brilliant! This looks Stunning on a plate! It’s absolutely divine to the palate. Nice creation!